Aug. 15, 2018 - 3D laser scanning, also called geometric scanning, is the process used to measure the shape of logs or boards in a sawmill. It works by using a scan head to project beams of light onto the surface of the wood with a laser. A camera inside the scan head looks at the shape of the laser to generate plots of points along this surface. These plot points represent a cross-section of the exterior shape of the wood at different points along the board. The plot points are then fed into a computer program, referred to as an optimizer. From there, the optimizer will combine the points into a 3D model of the board to make decisions about the cuts to make for each piece of wood. 3D laser scanning can be utilized for almost every machine centre in green and/or dry sawmills. 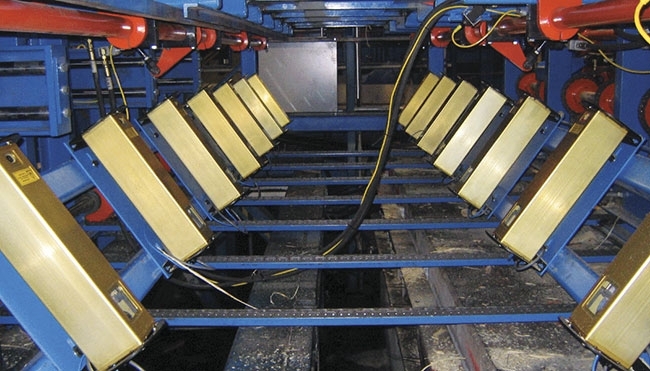 This article focuses on the application of scanning for boards on the trimmer sorter line. However, many of the concepts discussed here may be useful in other areas of your mill as well. In general, scanning is one of the best tools available to improve quality, increase yields, reduce waste, and generally ensure that sawmills are getting the maximum value out of each and every cut. Geometric scanning can also be used to verify the accuracy of cuts made before the scan, thus ensuring that your entire line is operating the way it was designed to. The trimmer sorter line is one of the most important locations for scanning in your sawmill, because it is often the last chance you have to adjust your product before it goes out to customers. The trimmer sorter line has also traditionally been one of the toughest places to implement successful scanning. This is due to the high speeds and large volumes of boards that pass through it. After all, all of the wood in your sawmill will make its way through the trimmer eventually. Let’s look at the scanner features that are most important for optimizing the recovery you can get out of each and every cut. Think of data density as the distance between the geometric points a scan head collects. In general, higher data density is better for all scanning applications, because it provides the optimizer with a more complete picture of the boards being scanned. For the trimmer line in particular, data density is a crucial feature to identify wane in boards. If data density is not high enough, steep wane can hide in the “blind spots” between a scanner’s data points. Data density can be measured both along the board, and across the board. You may have a different density of data for each of these two measurements. For trimmer sorter lines, data density measured across the board is the most critical. The primary driver of across-the-board data density is the scan speed of the scan head. This can be thought of as the rate at which the scanner is taking snapshots as the board travels transversely through the trimmer. 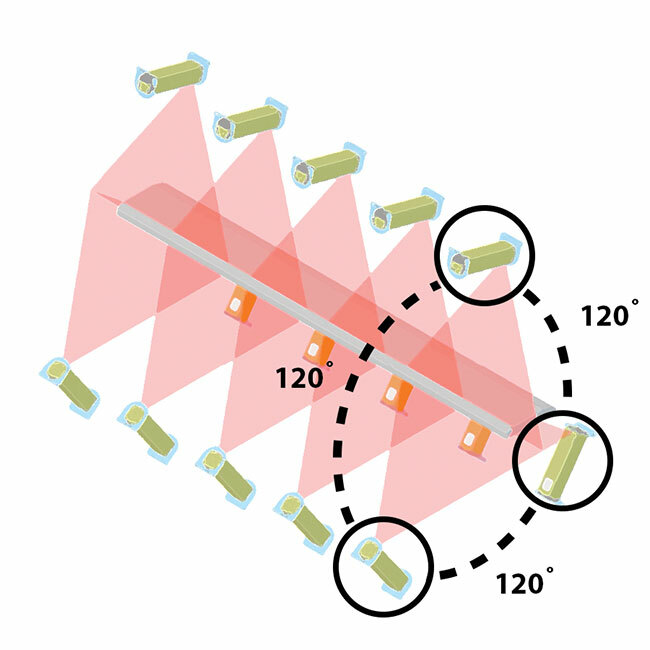 Think of face coverage as the number of board faces your scanning solution can see. In general, you want access to scan data on all four faces of the board. This will provide you with the most complete picture of each board to make trimming decisions. Providing data on the leading and trailing edges is especially important for trimmer applications, because these faces contain the best data for identifying wane. To get coverage on these faces, the layout and positioning of your scanner banks is critical. Imagine a single bank of scanners looking straight down, directly above your trimmer sorter line. This system will have a hard time seeing any faces beyond the top of the board, because the angle between board and scanner will create occlusion for the other three faces. The best designed scanning solutions for the trimmer sorter line will often have three banks of scanners, spaced 120 degrees apart. This allows each bank to focus on a smaller area, and provide better data for these areas. You can think of accuracy as how closely the data your scanning solution provides matches the actual geometry of the boards it is scanning. Accuracy is incredibly important because you want to be basing your optimization on good data that actually represents the size and shape of the boards moving through your trimmer. Inaccurate scanning data can lead to under or over trim, which will directly reduce the value you are getting out of your boards. There’s nothing more frustrating than trimming perfectly square boards because your optimizer is working with bad data! Although it can be tempting to look only at the resolution specification provided by your scan heads, there are a huge number of factors that can affect the accuracy of your optimization system as a whole. The important thing to remember when it comes to accuracy, is that your optimization system will never be more accurate than it’s most inaccurate component, and errors from different sources will add up. Scanner features are just the beginning of a successful scanning process for your trimmer sorter line. There are many other areas you can look at to maximize the value and return you can get from your scanning system. In fact, we’ve got nine more keys for you to discover. If you’d like to gather some more takeaways for conveyance best practices, as well as learn some additional questions to be asking yourself and your scanner vendor about reliability, I invite you to read the rest of our whitepaper at www.joescan.com/trimmer. This article is a condensed adaptation of a presentation made at OptiSaw 2018. Find that presentation at www.optisaw.com/presentations. Data density is crucial for identifying wane. Higher scan speed is the most important metric for improving the across-the-board density used to find wane. You want face coverage for all four faces of your boards on the trimmer sorter line, but the leading and trailing edges are the most crucial for identifying wane. Scanner placement and bank layout are the most important design factors that will improve your ability to see these leading and trailing edges. You’re never more accurate than your worst component. Errors across components add up. Joey Nelson is the president and founder of JoeScan, based in Vancouver, Wash. www.joescan.com.